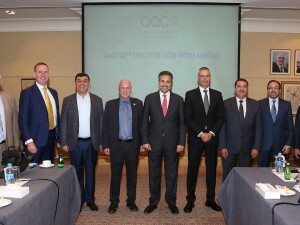 The Executive Committee of the Arab Air Carriers’ Organization (AACO) held its 82nd meeting in Amman, which was hosted by Royal Jordanian (RJ) Airline. The meeting, held at InterContinental Hotel, was headed by Saleh Bin Nasser Al Jasser, Director General of Saudi Arabian Airlines and Chairman of AACO Executive Committee. The attendees included RJ President & CEO Stefan Pichler, AACO’s Secretary General Abdul Wahab Teffaha and the CEOs of eight Arab airlines that are members of the Executive Committee. The participants held discussion on tackling several strategic issues and development of some joint projects among AACO members. Besides, the committee discussed internal issues regarding preparation of AACO’s 51st Annual General Meeting to be held between November 5 and 7, 2018. Pichler said RJ is pleased to host the chief executives of the Arab Carriers, and he underlined the significance of these meetings that gather the Arab airlines under one umbrella to find the best solutions to the problems that the aviation industry faces in the region. Royal Jordanian has been an AACO member since 1965. Teffaha said that one of the tasks of the Executive Committee is to supervise the work of the organisation and discuss the main issues that concern the Arab Carriers in various fields, which include joint projects among members being managed by AACO, aero-political matters in the world and the region and AACO’s priorities in the upcoming days. AACO is made up of 33 Arab airlines that operate over 1,400 aircraft with an average age of 7 years, half the age of other global fleets.